MADONNA Do you remember the 80's? That was Madonna then... and this is Madonna now... a children's' author? It is true, Madonna has made yet another transformation in her life. 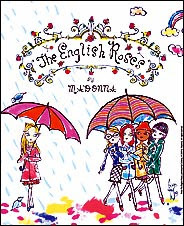 In 2003, Madonna released her first of nine children's storybooks, The English Roses. It was on New York Times bestseller list as #1 for 18 weeks and was simultaneously released in over one hundred countries and 30 languages. It holds the world record as the fastest-selling children's picture book in history. The English Roses book is one of the two picture books that are based around 5 girls that are inseparable friends and grow up in England. Each girls has their own personalities and interest yet they do everything together. The stories also include a pumpernickel loving, rough around the edges, fairy god mother that pops in every once in a while to add a whimsical touch to the stories and help teach the girls a lesson. Madonna has also incorporated these friends into 4 short chapter book series; The English Roses,Good Bye Grace, The English Roses, The New Girl, The English Roses, Friends for Life, and The English Roses, A Rose by Another Name. The English Rose book series explore feelings of envy, jealousy, friendship, love, and other emotions that young tweens may feel growing up. Within the books is a constant clique of a group of 11-year-old girls in contemporary England, and there are autobiographical elements to the theme. The audience for these books seemed to be geared towards 11 years to 13 year old children. I found that The English Rose series seemed more geared towards the female audience but her other picture books seem to address any audience including adults. 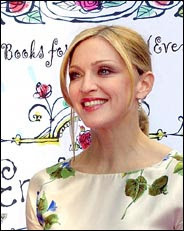 Along with the two English Roses picture books, Madonna has written four other picture books including; Mr.Peabody's Apple, Losta de Casha, Yakov and the Seven Thieves, and The Adventures of ABDI. Each book has a message or a lesson to be learned. They touch on subjects like rumors, greed, selfishness, sickness, and how to obtain happiness. The illustrations in all of these books are wonderful. Each books has a different illustrator but all the books including the chapter books are produced and published by Callaway. What could inspire the "Material Girl" Madonna to become a children's author? It is not because she is known as a Pop star Diva who has sold more than two hundred million albums worldwide with a over 25 Top Ten singles. Madonna's inspiration is not because she has starred in 18 movies, including my favorite Desperately Seeking Susan, and in various Broadway shows. Her inspiration in not because according to the Guiness Book of World Records 2007, Madonna is the highest earning female singer of all times. One such inspiration came from the loss of her mother who died when she was young, which she told London's Times that because of this as a child she "felt very awkward and out of place in school. Not popular, not attractive, not special in any way and I was longing for love and approval from someone." Another inspiration for becoming a children's author stems from becoming a mother and having 2 of her own children and the son that she has adopted. Madonna states having children opened her eyes on responsibility and selfishness. Motherhood has taught her to be aware of choices she makes. Lastly, her inspirations come from her strong believe in Kabbalah. Her faith in Kabbalah has taught her to send messages of sharing not for the sake of getting but for giving. Her giving has carried onto all of Madonna's children books. Proceeds for her books will go to the Los Angeles-based Spirituality for Kids Foundation.